Interested in how to create equitable real estate options for yourself…your community? Interested in meeting others you can network with to understand how to create a small scale development? Here is why YOU need to be at the Highland Park Small Development Seminar this Saturday! 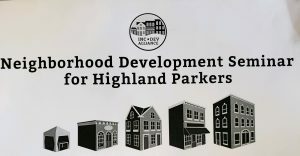 Small scale real estate development will be the topic of the day at Saturday’s Highland Park Small Development Seminar. Those in attendance will learn about how to take the first steps in their own projects after learning from Incremental Development Alliance examples that take a big picture view of neighborhood-based development. By looking at things from the larger picture, you can analyze what makes a good project, how building makes money and how small developers interact with the broader ecosystem of professionals in the built environment. The cost to attend is $69 through today (1/22/19), with a last minute registration rate of $89 available up until the seminar is full. It will be held on Saturday, from 9 a.m. to 12:30 p.m. at Nandi’s Knowledge Cafe, located at 71 Oakman Blvd. in Highland Park. You can register by clicking here. This seminar is considered a “catch-up” course to help meet the required prerequisite for the Small Developer Boot Camp, and will focus on project formation. Following completion, you will be able to participate in the two-day advanced bootcamp on Feb. 23-24. The endgame of this IncDev training series it to help attendees create a viable plan for a Land Bank property, which opens up the opportunity to purchase Michigan State Land Bank properties or Wayne County Land Bank properties for reduced rates.